The sun set on December 31st 2012, behind the serene hills away from the view of “Sarvajna Peetam”. “Sarvajna Peetam” is deeply associated with the great master, Avatar of Lord Shiva, Adi Shankaracharya. It is said that he attained the pinnacle of spiritual elevation and dissolved into the supreme consciousness at this place. (Some people say that the place where he left his body is in Himalayas). Nevertheless, this place is of great importance to any seeker of truth. Adi Shankara is said to have left behind nothing but a bunch of flowers when he dissolved completely. His body was never found. In order to reach here, and to spend the night here, it is quite challenging – if not impossible. As always with Mohanji, pre-planning cannot work. This was a spontaneous decision. Our friends and companions Madhu and Raju suggested us trekking up the hill from Kudajaadri, the place where Maha Kali killed the demon Mahisha and the trident that she used to kill Mahisha still stands as a testimony and warning towards all that is evil in the world. When dharma decays, destruction happens! This is the loud message. Scientists have experimented on the material with which the tall and imposing trident protruding out into the sky was made and could not yet determine the exact metal with which it is made. Divine creation, who can fathom! Trident of Mahishasuramardini at Kudajaadri. When she killed Mahisha with the Trident, because of the force, Mahishasura got buried under the ground. So now what is seen is the just top handle of the trident! Imagine the size of the whole trident!!! Our vehicle could only bring us up to this place where the trident is, at Kudajaadri. Then, from there to Sarvajna Peetam, we had to trek up almost a kilometer and a half. It is tough. It is literally an “uphill” task. And we had to carry everything as there is nothing available except a bare hill and the temple of Adi Shankara at Sarvajna Peetam. This place is very close to the “ChitraMoola” or “SiddharMoola”, a rock protruding out of the hill overlooking the valley where Adi Shankara meditated on Shakti and Devi materialized/ appeared to Him. He requested the Devi to follow Him to Kerala. Devi agreed on one condition. Adi Shankara would walk in front and Devi would follow. If he turns around once, doubting if she is following, she will stop following. In other words, it was a test of faith. If faith falters even for a moment, when doubt happens, grace will leave. Tall order indeed, but inevitable and essential if the aim is to reach the highest pinnacle of human existence. Adi Shankara agreed and started walking. He could hear the sound of jingles that the Goddess wore around her ankles, behind him, which assured Him of Her presence behind Him. He was re assured that Devi is following Him. As he reached Kollur, which is about 40 kilometers downhill, the sound of Devi’s jingles stopped. Adi Shankara became suspicious if Devi has stopped following Him. He turned to look. Devi was very much behind him, but, since the vow is broken, Devi said, “I will not follow you anymore. I will stay here at Kollur Mookambika Temple”. She merged with the already existing self-born power center and thence forth, the temple became known as Mookambika Temple. The place is Kollur in Karnataka State of India. Adi Shankara depended on his senses (ears) to ascertain Devi’s presence instead of his faith. Faith should surpass the senses and mind always. Senses and mind always limits us. Even though the Goddess merged with the stone, Adi Shankara made/materialized an idol which is the replica of the image of Devi that he witnessed. All the decorations are done on this idol, while all the offerings are done on the stone which has a golden lining in the middle. Right side of the Golden lining represents the trinity, Brahma, Vishnu and Shiva and left side represents, Goddesses Saraswati, Mahalakshmi, Durga and Kali. This round flat stone has its dimension below the earth to almost 42 kilometer radius. It is like the visible tip of a huge iceberg. And the saying is that “Nobody leaves this place empty handed. This is a wish fulfilling power center”. Travelling with Mohanji is always unique. There is absolute spontaneity and no pre-planning. He de-conditions us constantly through words and actions. It is not easy, but quite rewarding. While living it, we may not see its depth. When we look back at the things past, a silent “WOW” swells inside. Subtle are the ways of the Datta path indeed! How did we arrive at this place away from the average human ken! And what brought us here! Mohanji would only give a pregnant smile. He knows but will never show. No planning was involved regarding where to go and where to stay. Mohanji stayed where he got the place, he ate when he got the food. It was indeed a true wandering. Facilities just opened up. Everyone was satisfied. Nobody complained. No ego. No expectations! No comfort zones! He met many saints. He visited many temples. He took efforts to visit many ashrams as he came to know about them, on the way. He was welcomed at all places very well. The whole journey was just a grand happening and flowing with time and space. Many people flocked around him, even if they did not know him. Most received what they wanted. Mohanji kept moving ahead giving what others needed, ignoring his needs. Every place he visited, someone from our family accompanied him and experienced this, Venkat, Sumit, Madhu, Phaneender, Krishnan, Vineeta, Namrata, Jayant, Deepali to name a few. Never knew what Kudajaadri is until the journey started and we arrived! Geographically, Kudajaadri is a place 25-30 km away from Kollur Mookambika temple in Karnataka state of India. One travels by jeep to high mountains and then either walk 8km or reach the peak by jeep itself. Road is unmetalled, extremely rough and raw. During the travel, on one side you see deep valley, full of trees and thick jungle, in fact you actually perceive the depth of the valley, almost 1400 meters! Other side is tall mountain. Eyes never get tired capturing the spell binding beauty of nature. The road… to be least said about it… totally raw with big dips at times almost 2-3 feet deep, continuous U-pin bends as one travels up on the mountains. The drivers are very skillful but the ride could be scary for us at times… body is shaken to extremes, don’t know what happens to mind and our precious intelligence! 🙂 Keeping balance was difficult during the rough drive but Mohanji was sitting on the front seat next to driver .. completely still and silent! Madhu, Raju and I sitting at back side were trying every possible support to root ourselves tightly on the seat and be inside the jeep! This drive was for 3 hours only. We reached Kudajaadri just before the sunset. We witnessed a spontaneous miracle on the way. We hired the vehicle from Kollur. Usually, no drivers are interested to stay at Sarvajna Peetam because of the extreme cold climate at that height and lack of proximity to any shops or even a toilet. We bought all the stuff that we might require up there at night, from the small town that we passed. The vehicle driver agreed to stay with us and take us back to Kollur the next day morning. This was indeed a miracle. Without our knowledge, he had bought a couple of bottles of alcohol which he hid in his backpack, and he used it as back support while he drove the vehicle. Apparently, the bottles were hidden inside his clothes to keep it safe and invisible. As we reached half way, and as our vehicle turned into the rough roads that lead to the higher altitude, two policemen appeared from nowhere, stopped the vehicle, just picked up the back pack of the driver with fluency and purposefulness, and picked up just the two bottles hidden in his clothes! Perhaps the policemen knew that all drivers do this. They never checked any of our bags. They just picked up the bottles and left us. They also said that the driver could claim it back on his way back! Mohanji had a smile on his face while the whole incident was taking place, as he was the only one sitting in the front seat along with the driver. Mohanji always expressed his sense of humor. He kept teasing the driver on our way back, asking him if he want to claim the “empty bottles” back from the police! Mohanji obviously did not want anyone in our group to carry alcohol or meat to such a sacred destination! This was just not a pilgrimage, but, in a way, this was the trip of a lifetime. This was the trip to culminate the past and change a new leaf in our lives. The eventful year 2012 was ending and a fresh new life was beginning. The depth of it, we will come to know only in the days ahead. We arrived at Kudjaadri and after having darshan of Devi’s huge trident and the temples around, we started our journey up hill. We carried our bags of essentials as well. The mind was still looking at the vastness and expanse of the beautiful nature and the deep valley. The cold breeze would at times turn into blowing wind which penetrates through your head and ears. Seeing thick trees and jungle and listening to chirping of birds was quite relaxing indeed. I had never seen these varieties of trees before. I was slow to walk. Mohanji had gone ahead faster, but he would wait for me in between. We reached the peak of the mountain and noticed the small temple “Sarvajna Peetam”, the place from where Adi Shakracharya received the ultimate knowledge and dissolved into the universe! Last Sunset of the year 2012. The rigorous, up hill, yet spectacular journey called LIFE! Mohanji was quiet throughout the journey and walk. He also ate very little. He was totally within Himself. Witnessing the last sunset of the year 2012, the year of the shift of consciousness with Mohanji was a memorable experience. As we arrived at the Sarvajna Peetam, Mohanji went straight to the temple, with an unmistakable familiarity. Temple was old. Temple and the surrounding area are part of the reserved forest and certainly ignored and not at all maintained; but there was no dearth of energy. A sensitive person could definitely feel the strong and soothing divine energy. Of course, when Mohanji is around or even when one connects to his consciousness – even if he is not physically around, we could certaily feel his energy. At this place, with his presence, the whole experience was intensified or even magnified. On entering the temple, seeing the idol of Adi Shankaracharya, I felt that energy more prominently at heart, throwing me into silence and gratitude. There was unmistakable compassion in that energy. The inside of the stone temple was very peculiar. The roof has various yantras and chakras carved and whole structure forms a Meru. Nine chakras and one Sree Chakra depicted on the stone of the roof! What a sight! The most auspicious Shree Chakra is right above the idol of Shankaracharya, placed at the middle of the sanctum sanctorum! Bliss indeed! Madhu is a businessman, who owns business and property in India, Oman and UAE. 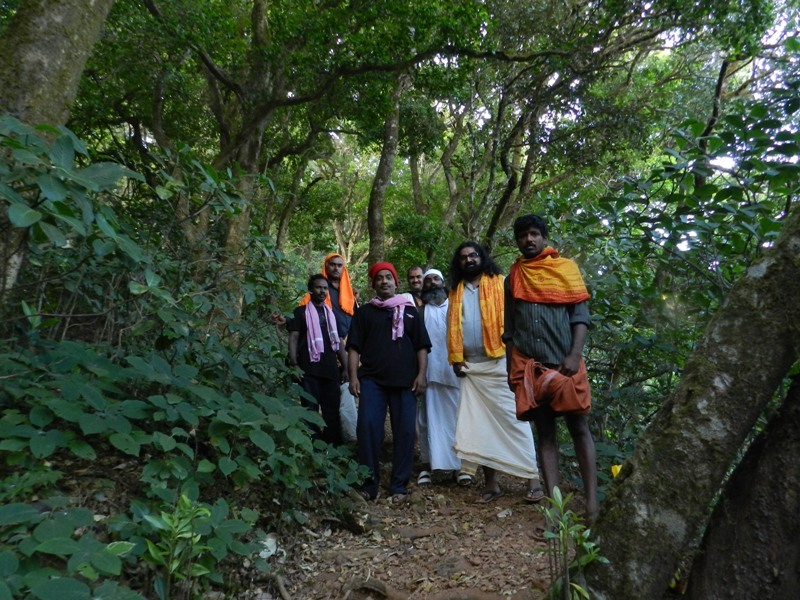 He hosted us during our trip to Bhagawan Nithyananda’s abode at Kanhangad in Kerala. He belongs to that place. Madhu had a desire to stay at Sarvajna Peetam since long. He could not believe that his wish is getting fulfilled on the night of 31st Dec 2012 and that too with Mohanji. Madhu is a silent person and humbly devoted to Mohanji. Madhu was filled with pure joy. There was a group of 6 people. They knew each other. They were connected to one saint of the Jnana Yoga path called Siddhar Das. This group has been regularly spending every year end at Sarjna Peetam since the last 6 years! Mohanji makes friends very easily. People also somehow get magnetically attracted towards him. Soon, all started interacting. Mohanji was talking very little. Answering exactly what is needed that too in short. The language was Malayalam so, I cannot translate anything. Mohanji was in his own realm, sitting quietly, just on the floor, leaning back on the pillar at the edge of the temple with his shawl around. Night of 31 Dec 2012 at Kudajaadri… Solitude descended on us as the grace from heavens. There were many people – mostly youngsters, smoking, shouting and running around, when we arrived towards the sunset of January 31st. There were some families and children too. Soon, after sunset, everyone departed, went back to Kudajaadri, downhill. The general rumor which the tiny snack vendor articulated was that since there are possibilities of forest fires triggered by camp fires and since there were incidents such as alcoholism and quarrels in the past years, the police and forest guards usually do not permit people to sleep the night over. They drive everyone to camps at Kudajaadri. Because of this fear, all left, except us, Mohanji, Madhu, myself, Raju and our driver Biju, plus the six people including Swami Siddhar Das. The place became quiet as the sun set and the priest of the temple also left for Kudajaadri. The juice and snack vendor packed his bags and left too. Solitude descended on us as the grace from heavens. Soon it became dark. Apart from a small oil lamp burning inside the sanctum sanctorum, there were no lights. When electricity had not reached that height, how could lights be there! Breeze was mild with tolerable cold. There was never a chill as predicted by the driver and other companions. Lightening was continuously happening on our left side of the temple in the sky, afar. Occasionally it thundered threatening a rain; and even though some predicted rain, it never rained. Some of you who travelled with us to Kailas would remember the snow fall that we witnessed on our left side while we reached Manasarovar and the prediction of our guide that we may only have about an hour to take the dip before the cloud rains ice on our side of Manasarovar. After Mohanji said “Enjoy as much as you like”, how those clouds went around and vanished towards Kailas! This was quite similar. Even food was sumptuous. Both our groups unpacked our kitties and food flowed and the evening dinner was delicious. Madhu got to know that, we cannot cook there due to forest rules. So, he asked the priest if he could get some sambar-rice. Priest walked down all that distance and got us hot rice by 9pm. The food was simple and quite satisfying. Mohanji slept on a simple mat inside the sanctum sanctorum just next to the idol of Adi Shankaracharya, under the shield of many chakras and meru of the stone roof! Few of us accommodated ourselves outside the sanctum sanctorum. Some made fireplace down on the ground and slept there. Spending a night at Sarvajna Peetam! Think about it! Well, thinking has no scope. There was only silence. Silence of thoughts! Earlier, when there was some signal on telephone, a message to Sumit was managed to inform all that Mohanji is at Sarvjna Peetam and cannot respond to greetings personally. Mohanji knew that many will be trying to contact him on year end. Mohanji wanted to send new-year message to you all. He sent a new year’s message to all through Sumit. By midnight, two guards came to check on us. They never quite disturbed us, and went their way, after ensuring that we are fine. We had a peaceful night. The First Sunrays of 2013.. the eventful year 2012 has ended and a fresh new life began… the depth of it we will know only in the days ahead.. The quiet night was over. Mohanji got up early. He was quietly gazing at the sky and had deep piercing look all around the nature. Soon, with beautiful display of colors, the first sun of the 2013 showed its glory. Mohanji bowed down to the Sun god. Our New Year started at Sarvajna Peetam, with Mohanji! We packed and started descending. Before we started, we bowed down to the idol of Adi Shankara and thanked Him for hosting us so beautifully, and providing us everything that one could imagine, at a no man’s place. The downhill journey through the thick tall trees..
All those who were regularly coming there said, “We have never had such beautiful time here! This time, weather was comfortable, neither had it rained, nor was it cold. Apart from 10 of us, no one else was there; as if this was a special time and place kept for us. Many times we have faced strong winds and extreme chill. Sometimes, people drink alcohol here; eat non-veg disturbing the sanctity of the place. This was the best spiritual experience we ever had. We feel relaxed and light”. I do not know how much they understood Mohanji, but they were certainly grateful to Mohanji. On our way down, we worshipped the Ganapti idol which is inside the Ganapati cave. This is also such a powerful place. Since there was no priest there, Mohanji served holy water to everyone. We descended down to Kudajaadri, through the forest, near the Ganapati cave. We descended down and arrived at Kollur Mookambika temple on January 1st 2013, and had the darshan of the eternal Goddess on the auspicious day of the year. Unpredictability is the beauty of our existence. Flexibility adds flavor to our existence. When we are stiff and rigid, we fail to enjoy life. This message from Mohanji was ringing loud and clear in everyone’s mind. What a New Years Eve! Mohanji – wandering away into eternity. Always with us, yet, always beyond us!! !